Research in the design profession has many methods and outputs. Some clients require and value a research and synthesis process before a design is considered, while others want an experts design direction. As a practicing designer, design researcher, design educator, and design manager, I have become ever more appreciative of a strong research methodology and process to inform opportunities. Undergraduate design school rooted one in the foundations of visual literacy and form to support print, branding or environmental graphic design projects when in practice. With a strong foundation in hierarchy, form and message development I have delivered solutions appropriate to a range of target audiences. However, these were often limited in scope of audience understanding or engagement. As projects become larger and more complex, a strong contextual research process can be used to truly understand an audience or culture that can then inform appropriate strategies for designing messaging, tools or systems. A project with colleagues Amber Benson and Jason Spinks demonstrates how deep observations and contextual inquiry of letterpress practices and cultures can shed light on new opportunities. For the work each of us selected a press in our respective city and began with fly-on-the wall observations. We developed interview questionnaires and spent many hours embedded in the process of letterpress culture, sometimes taking up the actual making of printed work or even attending workshops and events. This contextual research (often also called ethnography) was a deep dive into the power of being present and deeply observing, listening and capturing every detail of the project. The fifteen-week process resulted in an opportunity map. 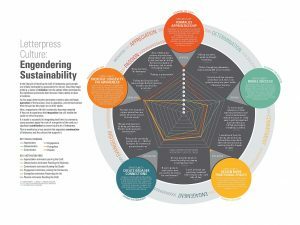 The map was titled “Letterpress Culture: Engendering Sustainability” and describes the life cycle of learning the craft of letterpress and what motivates individuals to continue on a path to passion. We identified key steps, from initiation in to the culture, operation of the business, integration into the community, then contributing to profession and finally continuation of the culture to passion and sharing of the practice. Each step was supported by key insights from our interviews. As a collaborative project in three cities we were able to identify similarities across all that resulted in a unified understanding of the culture. The map is in some ways a path for those potentially exploring the practice but also a visualization for further opportunities to advance or engage with the practice of letterpress printing.